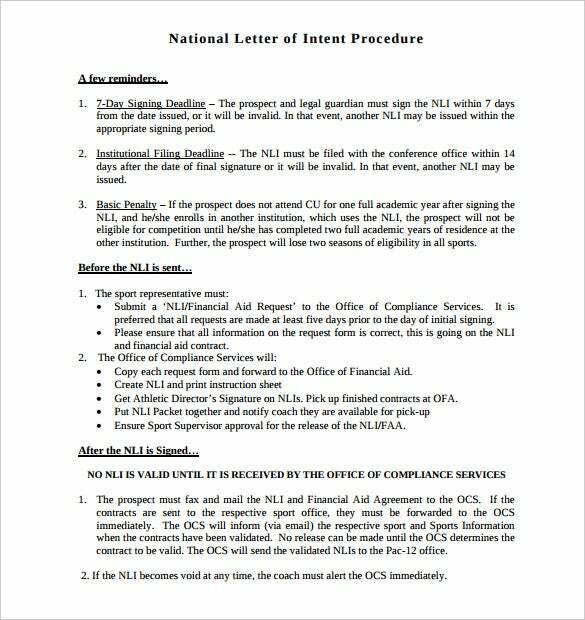 7+ National Letter Of Intent Templates – Free Sample, Example Format Download! Different students opt for different career choices. When a student athlete wishes to pursue his career in sports field and tries to get a recommendation letter for admission for higher studies, a letter of intent comes in handy. This document is required to certify the student’s commitment to get admission for higher studies in a specific field. 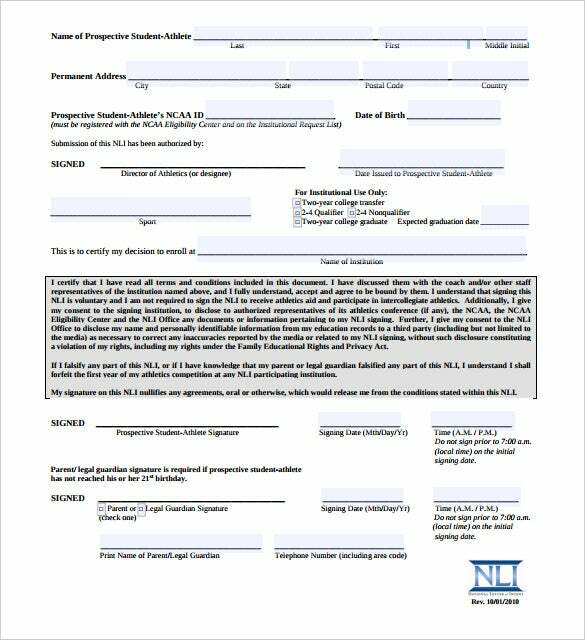 The sample national letter of intent templates are very useful and help anyone interested in taking the sports career forward. 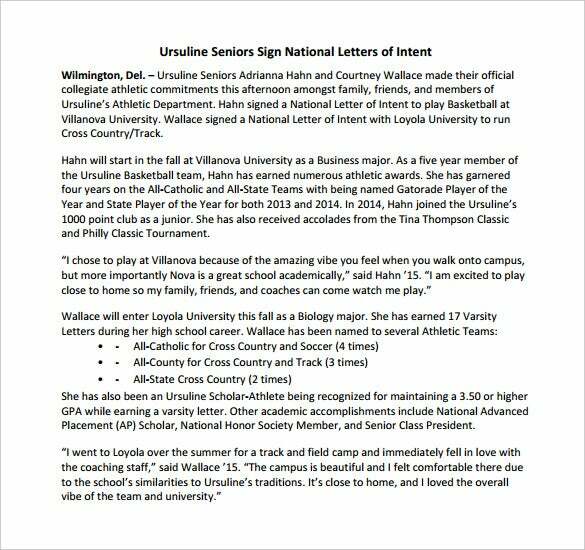 You can also see Free Letter of Intent Templates. A National letter of intent sample signifies that the prospective student-athlete would be attending the NCAA institution for one whole academic year (2 semesters or 3 quarters). 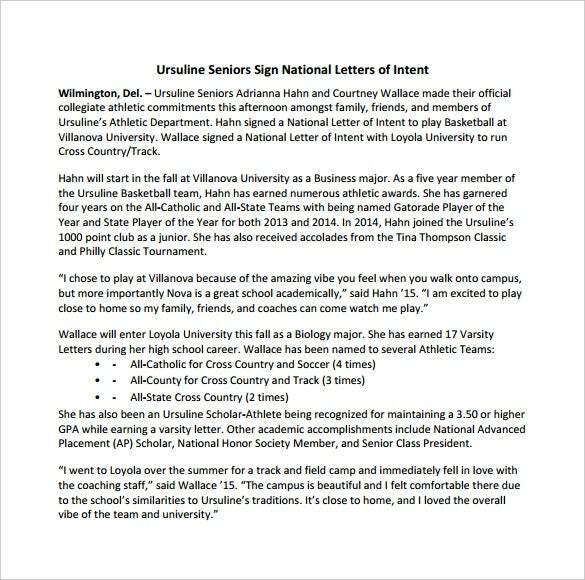 The letter also implies that the student would receive athletic aid from the institution. cubuffs.com | This Sample National Letter of Intent format that actually helps you by providing guidelines to write a well balanced letter document and fruitful for your purpose. This format includes reminders and checklists for you to write a successful one. bsubeavers.com | This kind of a national letter of intent sample is a very easy to create one and easy downloadable in PDF format. Since it is in a question & answer form it takes less time to create and also easy understandable with important points highlighted. 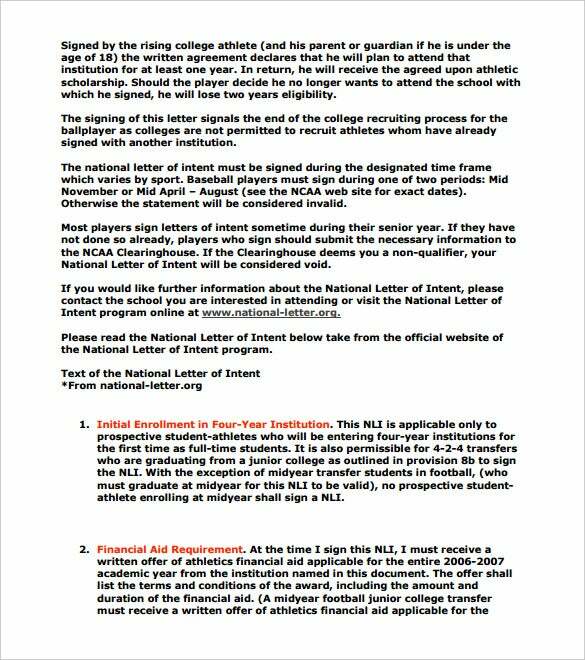 hamptonroadssports.org | This Sample National Letter of Intent gives you the opportunity to apply for higher career in a national football college. It is actually an application form like format where you have to enter your particulars. The important notes related to your form filling are also listed at the bottom. athleticscholarships.net | This kind of sample is a 3 pages PDF form through which you can apply for your higher qualification at NCAA (National Collegiate Athletic Association) colleges and universities in your locality. This form like template has a single page form with two pages of instructions to fill the form. 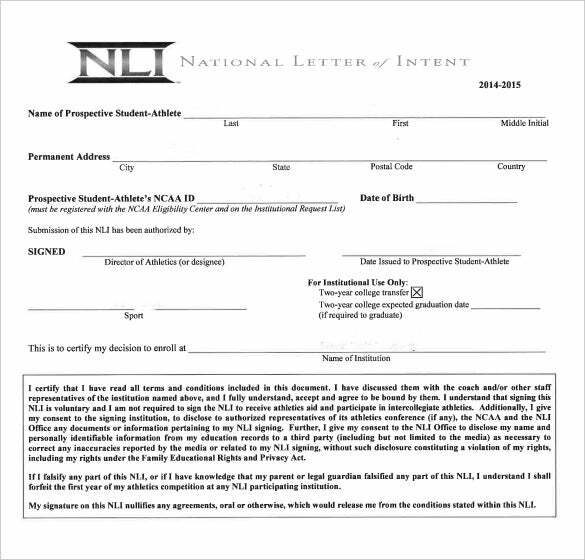 baseballcoaches.org | A baseball athlete willing to get admission in a higher study may follow this sample baseball national letter of intent template. 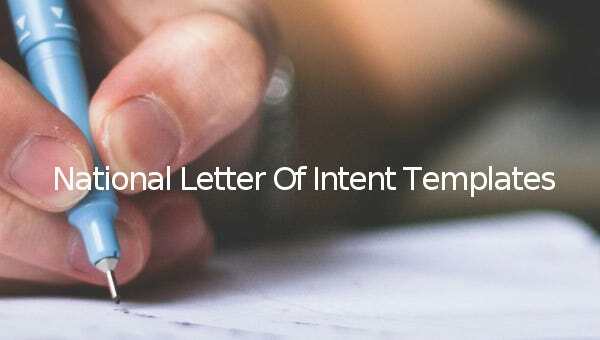 This is an easy printable template and contains point wise description of various important factor related to the formulating of an intent letter. Coaches generally don’t like to sign a player who has not signed a letter of intent unless and until he/she is top tier player. After signing a letter of intent almost no players remain unemployed. So it is a qualifying star for recruitment with teams. Unless and until you have not signed the National Letter of Intent you are not entitled for the processing of the Grant-in-aid paper works. 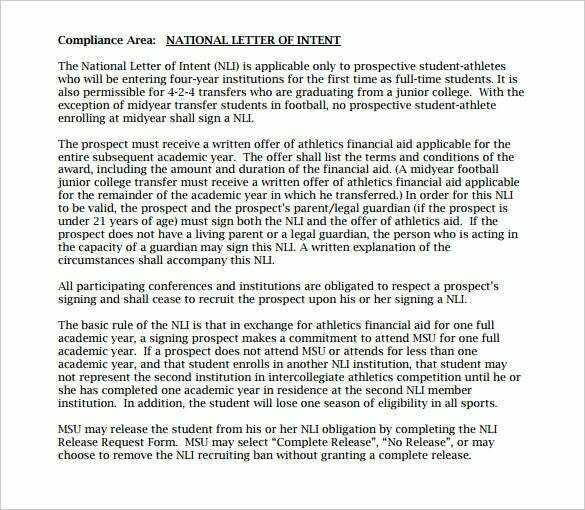 Signing a NLI makes you officially booked and the recruitment process ends there. It also helps you to stop unnecessary calls from schools and colleges any more. Signing a NLI gives you clear cut knowledge about where you are getting engaged this season and you need no more schools and colleges to contact you. To get aids and grants you have to meet the NCAA eligibility criteria. Also to get admission to colleges you have to meet the NCAA eligibility criteria. You would get chance to sign with another school in case you have the NLI signed and your current school discontinues the sports you have signed for. 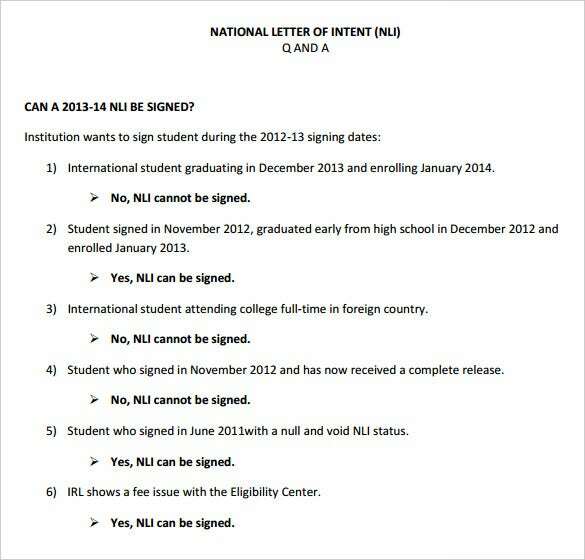 In case of a year’s absence from your school your signed NLI is going to save you and give you chance to get in to another school without any complications. You would not require to face a penalty in case you have signed the NLI and going to join the Military or church mission for a period of 12 months. The Sample National Letter of Intent templates mentioned from our collection are best ones with easy customization options. All are available in printable and editable PDF formats which are convenient to use and time saving as well. Just download these professionally written formats, and print them after editing them as per your requirements.